The catalytic functionalization of inert C-H bonds of hydrocarbons remains one of the foremost challenges facing synthetic chemists. The ability to selectively manipulate C-H bonds of arenes, alkanes and more complex organic molecules would open the door to a wide range of useful synthetic transformations. For example, aromatic substrates are prevalent in both commodity chemicals and higher value fine chemicals. Alkyl arenes are produced annually on a scale of billions of pounds and are used precursors to plastics, detergents and fuels. Friedel-Crafts catalysts have been used to prepare alkyl arenes; however such systems suffer from drawbacks that are inherent to the catalytic mechanism. Solid-state catalysts, largely based on zeolite materials, have provided improvements, but these catalysts function by the same acid-mediated pathway as Friedel-Crafts catalysts and are often subject to similar limitations. Transition metal catalysts can mediate the conversion of aromatic substrates and olefins to alkyl and vinyl aromatics, and such processes offer opportunities to develop synthetic methods that are more flexible to traditional routes such as Friedel-Crafts catalysis; however, substrates are often limited to heteroaromatics or compounds that possess activating groups. 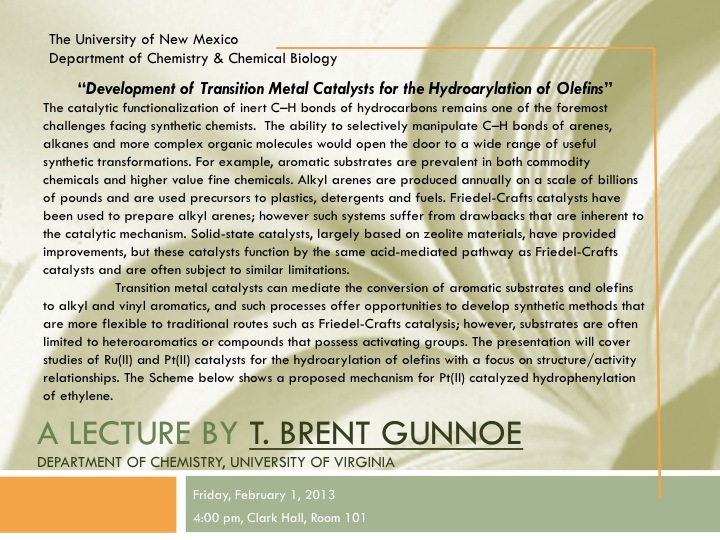 The presentation will cover studies of Ru(II) and Pt(II) catalysts for the hydroarylation of olefins with a focus on structure/activity relationships. The Scheme below shows a proposed mechanism for Pt(II) catalyzed hydrophenylation of ethylene.